Welcome to the 1st thread about King Willem-Alexander of The Netherlands' Current Events. Please post current news and pictures only of Willem-Alexander in this thread. 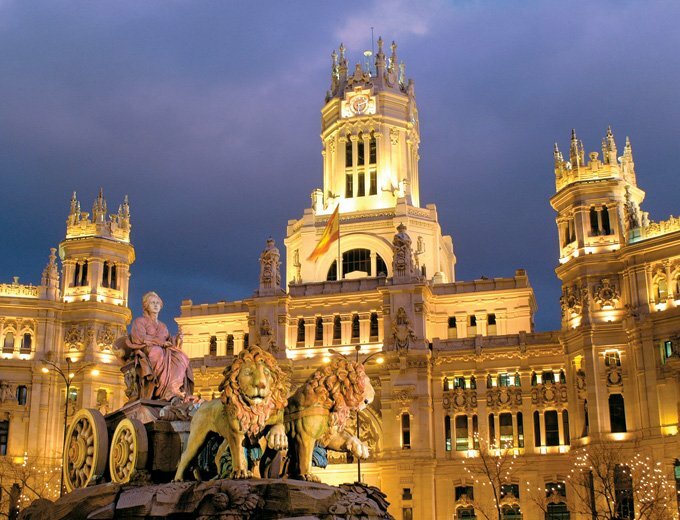 Orange light on the fountain and the Palace of Cibeles in honour to the Netherlands. They will be "dyed" this way because of the inauguration of King Willem-Alexander in the Netherlands, which will be held on April 30th in Amsterdam. That's a lovely thing that's being done in Spain. Thanks for letting us know Annie. HM The King appointed his cousin His Highness Prince Maurits as his Adjutant extraordinair while Prince Maurits also was elevated to the rank of Captain-Lt of the Royal Navy. nice to see the king and queen with the girls in the palace! and constantin's familiy too. mabel don't go with the girls? a little question, maxima and williem alexander have to move from they old house to the palace in la haya? They will move to Huis trn Bosch on a later date. But it isn't that far from Eikenhorst, perhaps 10 minutes by car. The new king will leave 'his house' the way it is. Meaning no new appointments for courtiers. King Willem-Alexander will become patron of the Dutch Biblical Society. I wonder was Beatrix involved in this organisation before her abdication? Since king Willem II, every Dutch monarch has been patron of the biblical society. I thought he was giving up all patronages in order to be seen as King of all the Dutch. No,he will keep some,some are under review,others ditched,and some new.All in tradition and accordance of His new role. The events that WA and Maxima attended as CP and CPS....how will this be handled now or who will attend? They will attend functions as King and Queen with other Monarchs, so who will attend on their behalf when the functions are for the CP and CPS? Perhaps one of his brothers and their wives? My apologies if this has been addressed previously. Some functions they will be represented by either Princess Beatrix or Princess Margriet and / or her husband,Pieter van Vollenhoven.And since Prince Maurits was appointed his Adjutant on wednesday it is expected he too will be in attendance on behalve of the King at various occasions.Constantijn and Laurentien won't do a second Margriet & Pieter in terms of assistance,they prefer to keep their life as it is,only with exceptions being made and under review as they occur.Eventually Maurits and Marilène might represent more while the older generation retires more and more...all being in their 70's at present.And it will take at least another 9 years,as we all know,before any of the three Princesses are availeble for solo representation.For all the Obvious reasons Friso and Mabel will not represent. Dutch King Willem-Alexander chats with International Monetary Fund (IMF) managing director Christine Lagarde during an audience at the Huis ten Bosch in The Hague, on May 6, 2013. Christine Lagarde, former French Finance minister, is in a two-day visit to the Netherlands. I can't see the picture gallery sadly. But there is a picture in this newspaper article of the telegraaf. HM King Willem-Alexander conveyed his sorrow and compassion with the family and friends and the people of Curacao on the murder of Korsou politician Wiels who was murdered on the Island last sunday. HM King Willem-Alexander appointed Marco van Walstijn as Director ICT at his Court last week.A first,both the appointment in His Court as well the function of Director ICT in that frame. HM received the Credentials of the Ambassador of Pakistantan today,HE Mr.Moazzam Ahmad Khan was the first Ambassador to present his Credentials to the new Monarch.The new Ambassador of Morocco,HE Mr.Bellouki,also presented his Credentials this morning.